CRM systems were born from a rapidly growing need among all types and sizes of businesses- to capture and maximize leads, clients, and customers. In fact, 91% of companies with 11 employees or more now use a CRM and 50% of companies with less than 10 are using CRM technology as well. 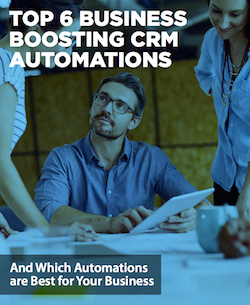 Download and read this guide as it will cover the key benefits of CRM automation, explain the top six business boosting CRM automations, and provide tips for choosing the best CRM automations for your business.